Margaret Foster, granddaughter of Darwin D. and Isabelle Martin, just sent another "care package" of family artifacts to the Martin House and Graycliff. In this latest shipment were two unique items for the Martin House: an Asian rug that appears to be the hearth rug used in the reception room, circa 1912 (shown in Müller photos of that year) and a fabric book cover, apparently Japanese-made, with an elaborate, embroidered Phoenix motif. 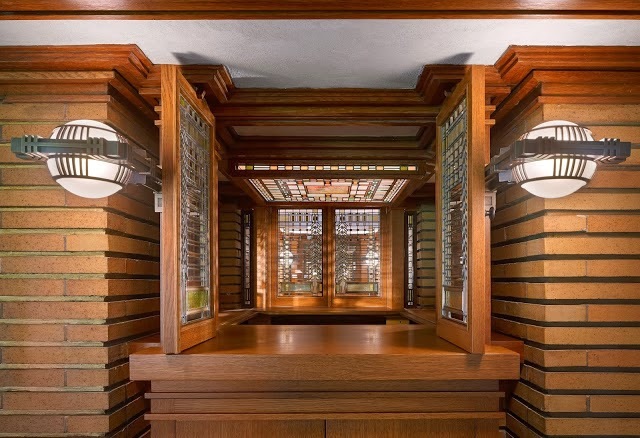 The latter may have come from the cache of items that Frank Lloyd Wright brought back with him from his first trip to Japan in 1905 and distributed to clients such as the Martins. Further research is needed to confirm these identifications, but their provenance as items handed-down within the family is clear. Thanks to Margaret and her family for their wonderful ongoing generosity in adding such objects to the Martin House collection!